You might have thought you’d heard the last of MiFID II – unfortunately not. A further member joined the MiFID II party and this is not someone distributors and financial advisers have welcomed with open arms. 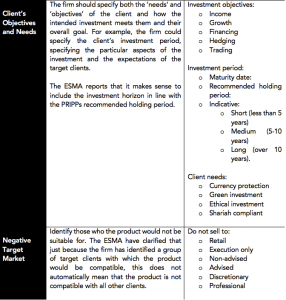 As part of MiFID II, we (compliance officers) are looking for Target Market Analysis documents within firms. This document is a summary of, as you might expect, a financial advisers target market. Following on from the FCA’s obligation of its second policy statement and finalised the Product Intervention & Product Governance Handbook (PROD) as well as the release of the European Securities and Markets Authority’s (ESMA) final report on product governance, we have focused on the obligation of manufacturers and distributors in relation to the identification of the target market for products and what this means for financial advisers. So, let’s recap: what are the MiFID II product governance provisions? How does this apply to me, a financial adviser? Under PROD, you are considered a distributor and must have measures in place to ensure that the products and services you sell are compatible with the needs, aims and characteristics of the market. 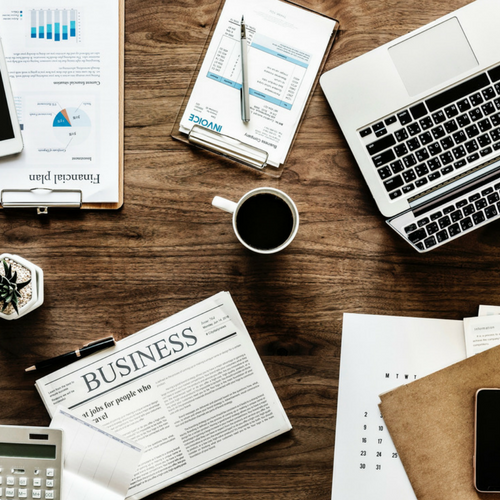 This means your company, when providing investments, need to decide on the target market for each product and then you need to ensure these are the right fit for the client that falls into the category. On top of this, the rules also demand ongoing assessments as any change in objective or charges for a fund could trigger a review of its target market. This is an obligation and cannot be circumvented by a suitability assessment. You’ve got your work cut out for you guys. Consider the products target market and the groups of individuals whom it is unlikely to suit. (This information can be gathered from the manufactures as when they design a product, then should have a target market in mind). Once the target market has been decided, you need to see if the distribution strategy meets to needs of the target market. Each product should be regularly reviewed to ensure that each product remains consistent with the target market’s needs. Changes must be made if any problems have been identified. Inform the product manufactures with information on the sales and, were appropriate, information on the regular reviews. 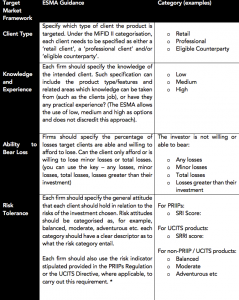 * Firms must decide for each PRIIP product that they manufacture or distribute which category it falls into in order to calculate a market risk measure (MRM) and a credit risk measure (CRM). These two measures are then combined to produce a Summary Risk Indicator (SRI). The SRI is the summary risk indicator which gives a product a risk-based score from 1 (least risky) to 7 (most risky). The SRI requirements are set out in the Regulatory Technical Standards. The SRI applied to products that come under the scope of the PRIIPs Regulation. The SRRI is the Synthetic Risk and Reward Indicator and applied to all UCITS. The SRRI should be based on the volatility of the fund using weekly or monthly returns covering the previous five years. In light of the outcome of the volatility calculation, the UCITS should be assigned to the appropriate category on a numerical sale of 1 to 7.